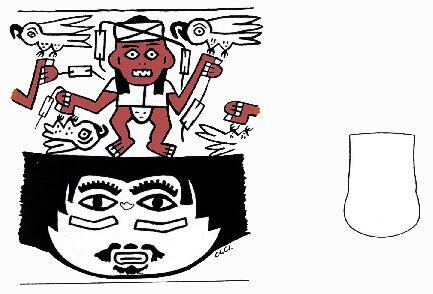 Description: vase (detail), drawing after Culturas precolombinas: Nazca. Lima, 1986. Iconographic Features: Men hunting parrots (loros) by using slings. Hunter wears headdress wrapped with sling. Description: vase (detail), drawing after Gayton/Kroeber 1927. 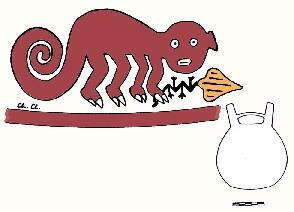 Iconographic Features: Long-nosed man hunting parrots (loros) by using spear thrower and bola. Description: double spout bottle, C-09808, M.N.A.A.H.-Lima. Iconographic Features: Parrot (Loro) Mythical Being holding rattle. Description: double spout bottle, C-09809, M.N.A.A.H.-Lima. Description: jar, Museo de la Nación, Lima. Iconographic Features: Two condors devouring men, one of them is decapitated (captured warriors?). Description: double spout bottle, C-59809, M.N.A.A.H.-Lima. Iconographic Features: Monkey holding jícima. Description: effigy vessel, drawing after Lavallée 1986, 110. Iconographic Features: Monkey and lizards as motifs on walls of architectural structure. Description: effigy vessel, ID number missing, location unknown. Chronological Era: Early Intermediate Period (EIP), Nasca 1 Phase. 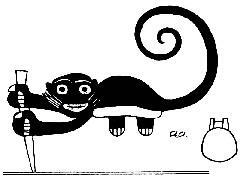 Iconographic Features: Monkey holding a cup (with fruits). Iconographic Features: Monkey holding capsicum pepper (aji). A bean and four pepinos are attached to its body. Description: textile sampler, drawing after Sawyer 1997. Chronological Era: Early Intermediate Period (EIP), Nasca 6 Phase (?). Iconographic Features: Mythical Monkey wearing forehead ornament, feather headdress and loincloth. One-Eyed Rayed Faces are attached to its back and tail. Description: ceramic vase, ID number missing, M.N.A.A.H.-Lima. 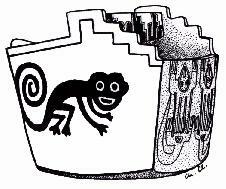 Iconographic Features: Mythical Monkey wearing feather headdress and loincloth. Also sleeves are visible. One-Eyed Rayed Faces are attached to its back and tail. Iconographic Features: Mythical Monkey wearing forehead ornament and surrounded by One-Eyed Rayed Faces. Trophy heads are attached to its back. Description: plate, redrawn after Schlesier 1959. 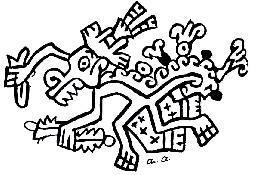 Iconographic Features: Mythical Monkey holding two rattles and capsicum pepper (aji). It is surrounded by fishes (? ).